In 1785, Jay had inherited a 287-acre parcel, originally purchased by his maternal grandfather, Jacobus Van Cortlandt. Two years later, he inherited an adjoining 316 acres from an aunt. He soon began developing the land as a farm, purely for business purposes. In the late 1790s, he decided to make the Bedford farm his home in retirement. He enlarged his farm manager’s house to become his own home, increased the number of outbuildings on the farm, and moved here in the summer of 1801. His wife, Sarah Jay, joined him later in the fall, and the couple lived here with the three youngest of their five children. Only months later, in May 1802, Sarah died. Jay never got over the loss of his beloved wife, but continued to reside on the farm for another twenty-seven years with some of his children and grandchildren. Jay’s daughter Ann, known familiarly as Nancy, took her mother’s place as female head of the household. Jay’s younger son William spent much of the first decade of the nineteenth century away from home, first as a student at Yale, then as an apprentice lawyer in Albany. Sarah Louisa, the youngest child, also spent much time away as she grew older, first as a student at a girls’ school in Albany, then later wintering with her older siblings, Peter Augustus in New York or Maria in Albany. Sarah Louisa died in 1818 at the age of twenty-six after a brief illness. John Jay was finally able to enjoy a considerable amount of family companionship after his son William married Augusta McVickar in 1812. William and Augusta moved into the house, and had five children by the time of John’s death in 1829. In his last years, Nancy was also still at home, and there were frequent visits from Maria and Peter Augustus. As for the farm, its produce changed over time. When Jay was alive, Bedford was part of the breadbasket of New York City, and the farm’s principal products were wheat, butter, apples, and pears. This remained much the same during the time the property was in William Jay’s ownership, following John’s death. It began to change in the next generation, that of William’s son, John Jay II. Given the condition of the roads and available modes of transportation in the early nineteenth century, the Jay farm had been very isolated, two days’ distant from New York City. The advent of the railroads in the mid-nineteenth century made it possible to ship produce much faster, and the farm’s products shifted more toward fresh fruits and vegetables and fresh milk. And now that Bedford was not nearly so remote from New York City as it had been, the area began to change character. John Jay II, William’s son, had married Eleanor Kingsland Field in 1837. The couple first lived in another house on the Jay farm until William’s death in 1858. John then inherited the main house, and they moved in after a dramatic remodeling, transforming the farmhouse into a stylish Victorian country retreat. They made their Manhattan home their principal residence, to be near John’s law office and their social life. The Bedford farm was still run for profit, but its commercial function was now joined by use as a summer home and country getaway for the Jays and their friends and relations. The leisure-class lifestyle progressed further with the next generation of the Jays. Col. William Jay and his wife, the former Lucie Oelrichs, were members of The Four Hundred, the exclusive social set associated with Mrs. William B. Astor, Jr. Col. William owned the Jay farm from 1894 to 1915. A lawyer like his father, grandfather, and great-grandfather, he had his office in New York, and made that city his principal home. As president of the Coaching Club, which held fashionable events in Manhattan and Newport, Col. Jay and his wife were leading society figures. Their home in Bedford became primarily a country home and only secondarily a working farm. They did another updating of the house in 1897, using Richard Howland Hunt as their architect. Col. Jay’s daughter, Eleanor Jay Iselin, was the next owner of the property. She and her husband, Arthur Iselin, were the first generation of the family since her great-grandfather’s to make the house their principal home. Arthur could now commute easily into New York for his work as a board member of the Chemical Bank, given fast train service to Manhattan. They enlarged the house in the mid-1920s with a large masonry wing designed by Warren & Wetmore, the architects of Grand Central Terminal. The farm was developed further, and its principal crops changed to eggs, waterfowl, and potatoes. Then, in 1929, came the Stock Market Crash. Much of the family fortune was lost. The farm paid poorly through the 1930s, and the costs of maintaining the estate became difficult. By the mid-1940s, as the Bedford-Katonah area was developing into a bedroom community of New York City, the value of the land became greater than the income the farm could generate. The Iselins began selling land, to be developed for suburban housing. Aware of the difficulty of keeping the property, Mrs. Iselin sought an appropriate new function for it that would honor its historic significance. In 1946, she offered it to be the location of the United Nations, but her offer was not accepted. Following her death in 1953, her heirs put the property up for sale. In 1957, the John Jay Homestead Association, led by Otto Koegel, was founded to save the property for public benefit. It brokered an arrangement where Westchester County would purchase the historic house and its formal estate grounds, then transfer it to state ownership for operation as a history museum. The Homestead became New York State property in 1959, and after restoration, opened to the public in 1965. Following the death of Otto Koegel in the early 1970s, the John Jay Homestead Association disbanded. 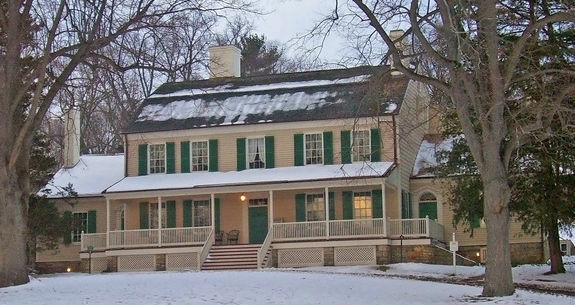 The Friends of John Jay Homestead was founded in 1977 as its successor.